Abstract This paper introduces the updated and extended Groningen Growth and Development Centre (GGDC) 10-Sector database. The database includes annual time series of value added and persons employed for ten broad sectors of the economy from 1950 onwards. It now includes eleven countries in Asia (China has been added compared to the previous release), nine in Latin America and eleven in Sub-Saharan Africa. We use the GGDC 10- Sector database to document patterns of structural change in developing countries. We find that the expansion of manufacturing activities during the early post World War II period was related to a growth-enhancing reallocation of resources in most countries in Asia, Africa and Latin America. This process of structural change stalled in many African and Latin American countries during the mid-1970s and 1980s. When growth rebounded in the 1990s, workers mainly relocated to market services industries, such as retail trade and distribution. Though such services have higher productivity than much of agriculture, they are not technologically dynamic and have been falling behind the world frontier. c) relative prices in the world economy do not fully reflect relative marginal productivities and marginal utilities among goods. Industrialised nations have, generally speaking, closely followed the United States in increasing the weight of the service sector since the 1980s (if not before). It is also widely known that during the same period, recently industrialised nations such as Brazil, Mexico China, Korea or other Asian Tigers expanded employment in their domestic manufacturing sector at the same time as their GDP was increasing. But what happened with the rest of the world? The short answer is that it is remarkable how little we know about the process in the rest of the world. In the paper distributed by NEP-HIS 2014-09-25, Timmer, Vries and Vries describe similarities and differences in the patterns of structural change across developing countries in Asia, Africa, and Latin America since the 1950s. In order to do that, Timmer and colleagues created, updated and (more than once) expanded the Groningen Growth and Development Centre (GGDC) Sector database. This database includes data from 1950 onwards on value added and persons employed for ten broad sectors of the economy for a group of countries. In its current version, the database includes eleven Asian countries (with the good news that China is now included! ), nine Latin American countries, and eleven from Sub-Saharan Africa. There are some important stylized facts that can be learned from the paper. First, since the 1950s workers relocated from agriculture into the manufacturing and to a lesser extent the (formal and informal) services sectors. Second, employment in manufacturing grew in the 1960s and early 1970s in the three continents. These changes responded to policies through which individual countries pursued to promote industry development. Along the same lines, an result from the study by Timmer and colleagues is that there has been a clear decline of the manufacturing employment share in Africa and Latin America since the mid 1970s while production and employment increasingly originate from services activities. In 2010, only 7 percent of the African and 12 percent of the Latin American workforce was employed in manufacturing. These figures contrast with what happened in Asia, where the share of manufacturing in value-added was on average 20 percent of GDP for the same year. According to the productivity measures by Trimmer et al., the gaps for developing countries are still huge and increasing for most countries. On one hand, the authors find that labor productivity in agriculture is much lower compared to services and even lower in relation to manufacturing. In 2010, for example, the agricultural value added share in Africa was 22 percent, while the employment share was 51 percent. This suggests agricultural labor productivity is about half of that of the average in the economy. In contrast, the services value added share was 50 percent while the employment share was 37 percent, and the shares for manufacturing are 10% and 7% respectively. On the other hand, productivity levels in manufacturing and market services have been falling behind the technology frontier (US in this paper) in Latin America and Africa, and they have been increasing (at a lower rate than I would expect, though) in Asia. c) the effects of the interaction between the changes in sector productivity and employment share per sector (dynamic effect). Their results suggest that the within-effect as well as the static reallocation effect are both positive. 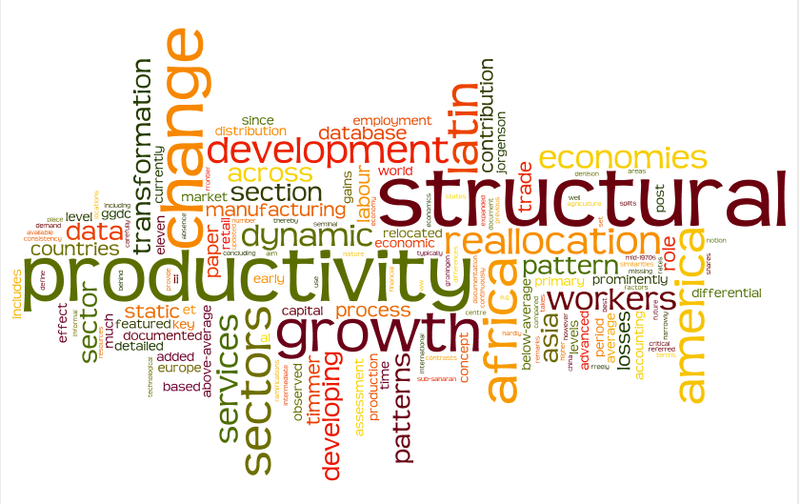 However, the authors find that the dynamic effect is substantially negative in Africa and Latin America suggesting the reallocation of employment to sectors (services) where the productivity increase is lower. In other words, this fact suggests that the marginal productivity of additional workers in these expanding sectors was below the productivity of existing activities. The paper has two main contributions. First, it is hard to stress enough how valuable the contribution of these authors is of constructing this new database. This task is not always valued at its worth. 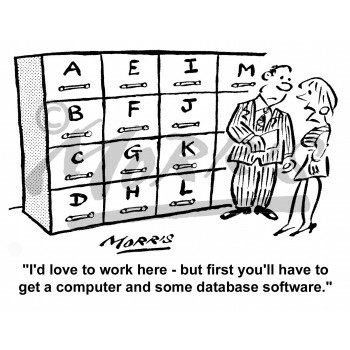 Creating a new database from different sources takes a large amount of work in order to achieve the consistency of concepts and definitions used in various primary data sources. Thanks to the authors, these data and documentation are now freely and publicly available online and it encourages us to continue the study of these issues. Second, the authors focus on the comparison of the productivity among these developing countries with the productivity of the technological leaders. This is the main point in this literature given that we still observe dynamic losses of relative productivity in many countries. The main challenge in order to make productivity comparisons is how to convert real value added into common currency units. To do this, the authors use this database and combine it with previous work or their own (mainly Inklaar and Timmer, 2013) to construct sector specific purchase power parity (PPP) prices. In their comparisons, they use United States as the frontier country and measure labor productivity relative to the frontier using the sector-specific PPPs. The bottom line of the paper is that most of these developing countries have failed to generate dynamic increases in relative productivity since they reallocated workers into the sectors where productivity grows at a lower rate. Thus, the main challenges are to reallocate excess agricultural workers if they exist, and to increase the productivity in the manufacturing and services sectors. With the agricultural and (sometimes) manufacturing sectors shrinking in their employment share, the relative dynamic productivity performance of the sectors where these workers are going to locate is the crucial part of the process of convergence. 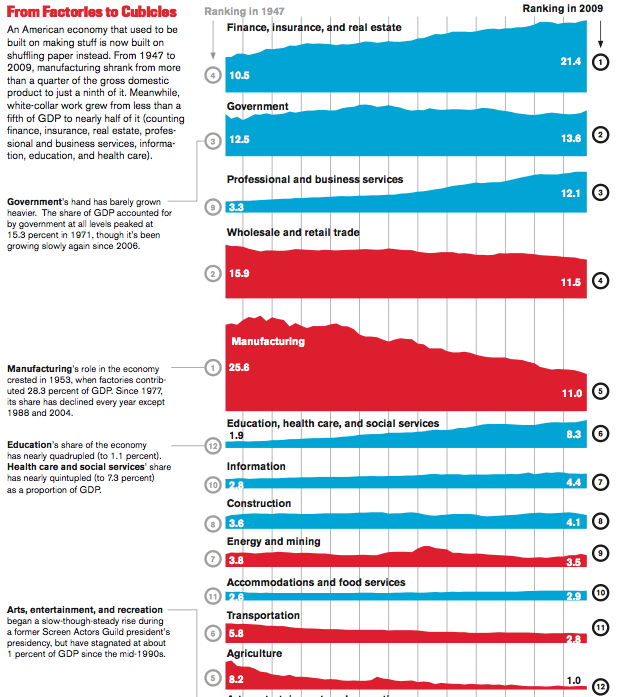 The decomposition of the economies in ten sectors provides a necessary step to understand the process of structural change and its effects on productivity. However, the change in the composition of what a country produces is a result of changes at the firm level in particular markets. This stresses the need for more studies at the firm level on the determinants of the productivity relative to the frontier by sector. This is even more important in the services sector where the evidence seems to suggest the existence of a duality, where some services have a high productivity level and others are informal activities with very low productivity that just hide unemployment. In sum, this paper adds to other excellent previous work from the same authors and gives us the big picture of structural change over the last 60 years for a larger set of developing countries. In addition, the authors have made available a new database that, combined with other data sources, can help to answer important development questions. As usual, we have made progress but still more work is needed to understand the key topic of structural change. This knowledge is necessary to implement policies that boost the productivity of firms in developing countries and, therefore, to improve the standard of living of their populations. This entry was posted in Analytic Narratives, Analytical Narratives, Economic growth, Economic History, Globalization and tagged economic history, globalization, USA on 2015-01-23 by sebastianfleitas.